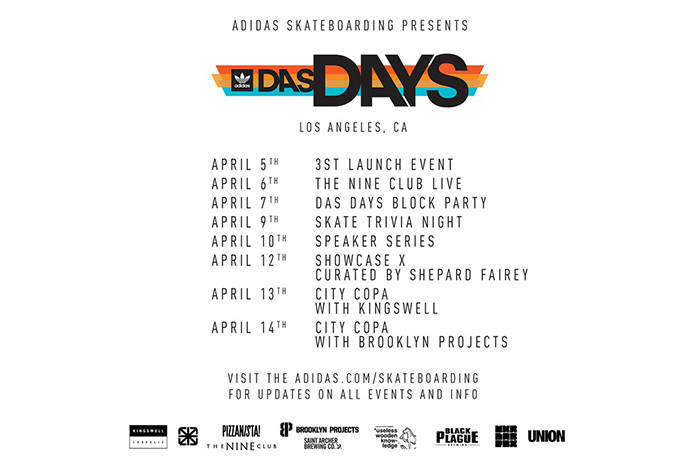 Hot on the heels of 2017’s Skate Copa World Tour, adidas just announced Das Days—a large-scale event series taking over multiple cities across the globe in 2018 including: Los Angeles, New York City, Paris, and Shanghai. Das Days will celebrate each city with a range of activities that elevate and unify the local skate community and beyond. The first will take place in Los Angeles on the week of April 5. Have a look at the full schedule for the Los Angeles stop below.